Probate is a legal process that happens after a person passes away, and leaves assets behind. These items are often left to adult children, spouses, siblings, cousins, friends and other acquaintances in a Will or trust, though sometimes, people pass on without any estate planning documents. 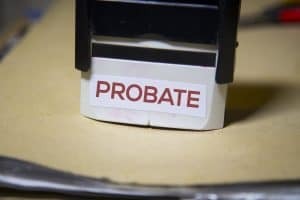 You can’t eliminate the probate process for your loved ones – even if you leave a Will – but you can take steps to avoid some of the bigger problems that can arise after your death. All you need to do is request the payable on death forms that your bank or investment firm has on file. Complete the forms and submit them to the bank or firm that administered the forms. They will then add the form to your file and place a designation on all of your accounts held with them. An excellent way to avoid probate complications is to transfer property prior to passing away. The gifts you give to your beneficiaries prior to death can be part of your estate plan. Just make sure the gift does not exceed certain thresholds, or else it could be subject to federal taxes. You should also make sure you put in writing that the gift is part of the recipient’s share of the estate you have built. Another way to help probate go smoothly is to create a revocable living trust. A revocable living trust leaves you the option of revoking the trust while you are still alive. The trust is a separate entity from you, but you become the trustee of the living trust, meaning you manage it as you see fit while alive. Upon your death, a person you designate as your successor trustee will take over management of the trust. This person will then be responsible for administering all of your property as outlined in your will. Should you become incapacitated, the successor trustee would operate the trust in your place. The easiest way to avoid probate litigation is to own your property jointly. This is the most common method because most people who get married wind up owning a home or vehicles together. In order to own property jointly you will need to have both of your names on the deed to the house or the title to your vehicles. When you die, the property stays with your surviving spouse and does not go through probate. Are you putting together your estate plan in Chattanooga? Do you need to update your estate plan? Make sure you put together a plan that helps you avoid a protracted probate process, so the estate is not taxed heavily upon your death. Call the office of Wagner & Wagner at 423-799-3532 to schedule a free consultation in Cleveland, TN or complete the contact form on the website.